Three Male Strangers At Japan explores the power and the harmony of verbal language with the corresponding gestural movements, in this case specifically related to contemporary Japanese men. 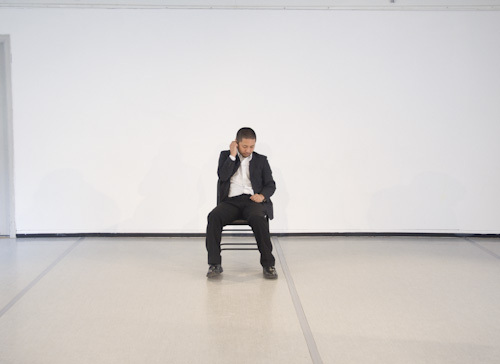 Through a triptych choreographic form, this fifteen-minutes performance displays impersonation of three Japanese male strangers, each sourced and composed through observation of their vocal traits, gestural movements and walking tendencies, to meditate the idea of cultural specificity and the heightened everyday life. Presented at Disjecta in Portland OR in June 2012.